Part of a Naval Battle Scroll from the Imjin War. ↑ Lee, Kenneth (January 1, 1997). Korea and East Asia: The Story of a Phoenix. Greenwood Publishing Group. p. 108. Retrieved March 26, 2015. 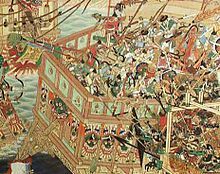 "Thus the Korea–Japan War of 1592–1598 came to a conclusion, with the Japanese totally defeated and in full-scale retreat. The Korean victory did not come easily." ↑ ۲٫۰ ۲٫۱ Hawley 2005, p. 538. ↑ Hawley 2014, p. 554. ↑ Hawley 2014, p. 555. اینگیلیسجه ویکی‌پدیاسی‌نین ایشلدنلری طرفیندن یارانمیش«Battle of Noryang»، مقاله‌سیندن گؤتورولوبدور. ( ۲۸ سپتامبر ۲۰۱۸ تاریخینده یوْخلانیلیبدیر). قارداش پروژه‌لرده نوریانق دؤیوشو گؤره داها آرتیق بیلگی‌لر تاپابیلرسینیز.